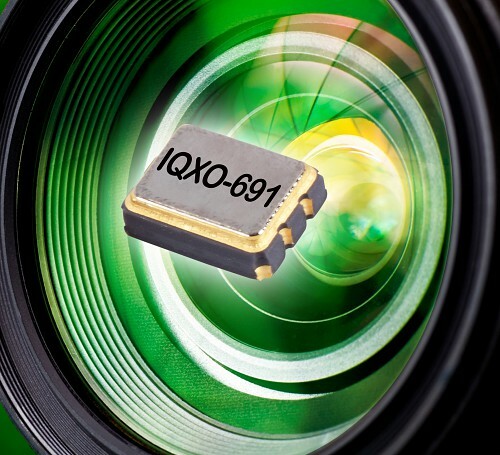 IQD has launched a new range of market leading ultra-low voltage CMOS based clock oscillators available at 0.9V, 1.2V and 1.5V. These oscillators are ideal for use in designs where improved battery life is critical including body cameras for security services, digital cameras, personal navigation devices (PND), portable audio players, portable test equipment, USB Interface, WLAN and wearable applications. Designated as the IQXO-691 series, the new oscillators are available with a frequency stability of either ±20ppm over an operating temperature range of -20 to 70 degrees C or ±25ppm over -40 to 85 degrees C.
Housed in hermetically sealed ceramic packages, four sizes are available: 2.5 x 2.0mm, 3.2 x 2.5mm, 5.0 x 3.2mm and 7.0 x 5.0mm. Frequencies can be specified in the range 10MHz to 50MHz and offer a start-up time of 10ms and a rise and fall time of 7ns. All variants include a tri-state function on pin 1 as standard and packaging options are either ‘Tape and Reel’ or ‘Cut Tape’. A range of standard specifications are available from stock immediately either direct from IQD or via its extensive range of worldwide distributors. Data sheets and live stock availability can be viewed at www.iqdfrequencyproducts.com.